I was browsing through Paper Weight in Somerset Mall this afternoon (they’re having a Christmas special, all magazines at R10) and spotted this mook. I found it rather strange that someone would publish a guide to a single web site. Sure, Facebook doesn’t exactly have the most intuitive of interfaces, but it is just a web site. Then there’s the fact that the very people that this is targeted at are probably the ones least likely to buy and read a printed instructional guide to an online environment. 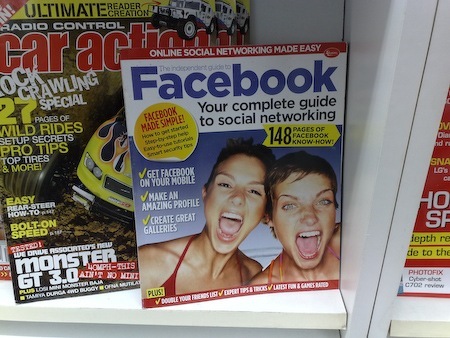 And what about the sub-title, Your complete guide to social networking? Facebook is hardly the be-all and end-all of social networking. This entry was posted in Thoughts and tagged book, facebook, magazine, mook, networking, social. Bookmark the permalink.